Magnetic Reclosable Fasteners Our range of magnetic products provide an alternative for your fastening needs! 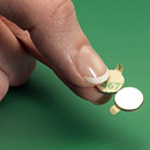 Our range of magnetic products provide an alternative for your fastening needs! Flexible Magnetic Tape Tesa Adhesive 12.5mm x 1.5mm x 30m Type "B"
Flexible Magnetic Mag Tape Tesa Adhesive 12.5mm x 1.5mm x 30m Type "A"
Flexible Magnetic Tape Tesa Adhesive 19mm x 1.5mm x 30m Type "M/Pole"
Flexible Magnetic Tape Foam Adhesive 12.5mm x 1.5mm x 30m Type "A"
Flexible Magnetic Tape Foam Adhesive 12.5mm x 1.5mm x 30m Type "B"
Flexible Magnetic Tape Foam Adhesive 20mm x 1.5mm x 30m "M/Pole"